Content: Covers the historical events and legacy of the French Revolution, with particular focus on the troubled post-French Revolution era that has shaped the modern world - East and West. The course is based on the seminal study by the leading Muslim intellectual Ian Dallas, presented in the book The Time of the Bedouin (2007), which lays the foundation for the aims and perspectives of the course. The aim is to present the necessary historical perspectives for understanding the ideological, economical and socio-political changes resulting from the revolution, in relation to the contemporary state of the world. The course will furthermore provide particular references to the scholars and thinkers that are not only crucial for the understanding of the past, but also for re-shaping the future, such as Ibn Khaldun and the later Carl Schmitt, Ernst Jünger, Martin Heidegger and Giorgio Agamben, among others. Course Leader and Main Lecture: Uthman Ibrahim-Morrison. 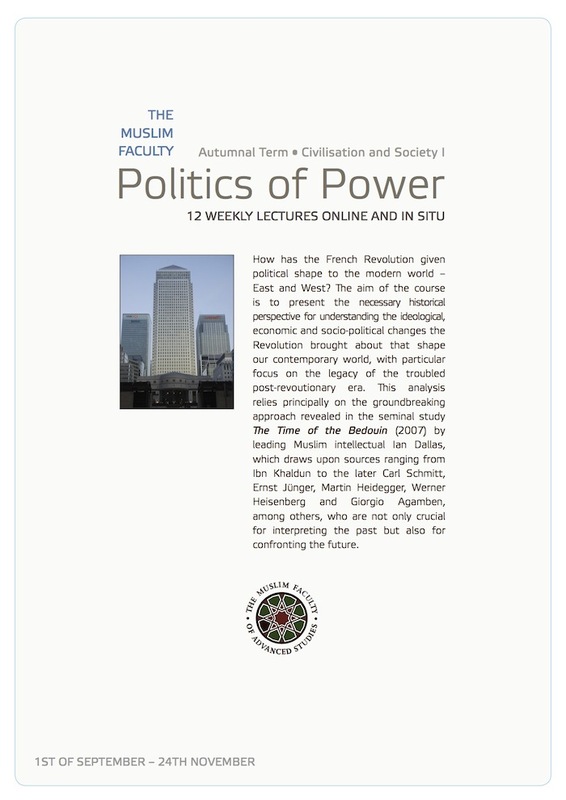 An examination of the roots of power and governance in modern society with reference to the legacy of the French Revolution and the insights of Ibn Khaldun regarding the cyclical nature of societal development. The purpose of this session is to paint a broad picture, with additional detail where required, of the geographical, historical, philosophical and political context out of which the French Revolution emerged and into which it spilled over. This is the first of four consecutive lectures focusing specifically on the matter of the French Revolution. The purpose of this session is to build a solid platform from which to embark upon this journey by providing a clear exposition of the key events and the circumstances in which they occur beginning with the accession of Louis XVI (r. 1774-1792) to the rise of Napoleon, but with particular emphasis on the defining period from 1788-1799. We will also aim to become familiar with the common terminology relating to the revolutionary period. This lecture is the second of four consecutive lectures focusing specifically on the matter of the French Revolution. Last week we endeavoured to establish a sound chronological map of the key events and the phases of the Revolution beginning with particular emphasis on the defining period from 1788-1799, and we also aimed to familiarise ourselves with the common terminology relating to the period. This week we will aim to acquaint ourselves with, let us say, the ‘flesh and blood’ of the story; the actors, the people, the atmosphere, the personalities. This is the third of four consecutive lectures focusing specifically on the matter of the French Revolution. In the previous lecture we aimed to acquaint ourselves with the living atmosphere of the revolutionary drama and some of its outstanding political figures and personalities, principally through the writings of Thomas Carlyle and Ian Dallas. In this lecture we will endeavour to examine the extent to which the French Revolution has served as a template for the formation of the modern state and its social, political and economic modalities. This is the last of four consecutive lectures focusing specifically on the matter of the French Revolution and its enduring impact, before we go on next week to look more specifically at what we might call the ‘post-nation’ state. Last week we examined four key features of modernity, whose direct and continued bearing on current social and political configurations feature most prominently in the extended political legacy of the French Revolution. This week we will look at the notion of the ‘post-nation’ state, the progressive degeneration of liberal democracy and some of the challenges it faces. Last week we looked at the notion of the ‘post-nation’ state, the progressive degeneration of liberal democracy and a number of the important challenges it faces. Today we will examine the very concept of revolution and the legacy of illusory political engagement. Last time we looked at the idea of revolution and how its meaning has evolved historiographically out of the French Revolution, as well as other tumultuous socio-political events. We also examined the illusory nature of liberal democracy in practice. This afternoon, we will seek to explore the reality of revolution in today’s world by looking at a number of examples from the relatively recent, to actual, ongoing instances of popular protest, and attempts at regime change ranging from so called ‘colour revolutions’ to the so called ‘Arab Spring’. An examination of how during the transition from the old European order to the emergence of nation-states, banking and finance came to the fore and have come in our time first of all to be free of control by governance and then arguably to exercise control over governance. Today we will be taking a slight step back in order to examine the major expressions of resistance or opposition which have sought to challenge the rise of liberal democracy to its current position of preeminence as the world’s most widespread form of representative government during the late modern period. A concluding summary followed by a useful discussion of issues arising from the summary and any questions relating to the future recovery of civilisation and our role, as Muslims, in that process.